Sixto "Tito" Ayala was born and raised in a family of performers and artists steeped in the rich cultural milieu of Loiza Aldea, a town founded by freed and runaway slaves on the northeast coast of Puerto Rico. He began dancing with the national Dance company, Ballet Folklorico Areyto, as a child and has worked alonside cultural icons such as his mother Celia Ayala, Don Rafael Cepeda, Petra Cepeda, and Ramito. 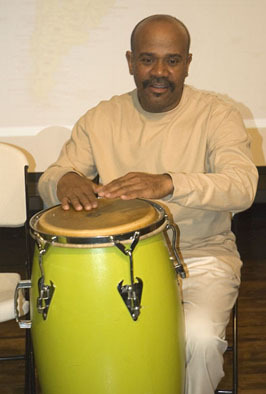 Tito has worked as a percussionist, rhythm section director, dancer, and teacher. He is passing on his knowledge of Puerto Rican dance to his daughters, including the carnival tradition of masquerading as a vejigante. Vejigante masquerader - his uncle, well known for his Loiza style masks, which has made for over sixty years. In September 2012, Tito and his daughter Estephany Navarro were awarded an apprenticeship to work on conga hand percussion.